The Canopy Phenology Activity allows participants to assess changes in forest canopy cover through the year. 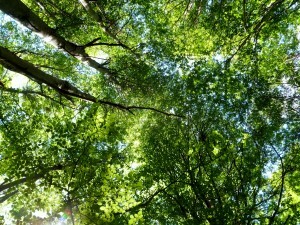 Looking up through the viewfinder and dividing the canopy between sky, leaves, and trees provides an assessment of canopy closure (Leaf Area Index). Completing this activity tells us how the phenological stage of the trees’ leaves differs during the year. When doing our research, we regularly return to marked points in the forest and record the condition of the canopy trees. There are various methods to assess the gaps in the canopy, but we take photographs using a camera fitted with a fish-eye lens to capture the whole canopy in one hemisphere. 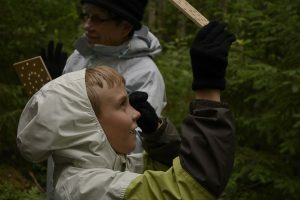 Instead of a camera, the canopy viewfinder used for this activity allows you to judge by eye the proportion of the canopy occupied by gaps or leaves. In spring, summer, and autumn these proportions change and different amounts of sunlight reach the ground. Many visitors pass along Lammi Research Trail through the year and although peoples’ estimates can differ, by aggregating together everyone’s counts of sky, leaves, and trees, we can obtain an accurate assessment of the changes in canopy closure. 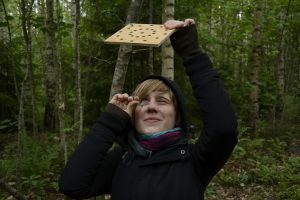 At the moment, Lammi Research Nature Trail serves as a test for this activity, but eventually we intend to install it in other forests around Finland and Europe. So let us know what you think. And thanks for taking part!